CHIMP is a free downloadable ICM calculator for tournament players. So instead of having to use an online ICM calculator, you can do your ICM calculations offline. With CHIMP you can work out the monetary ($) value of your stack in tournament games. So for example, if there are 3 players left in the tournament and you have 4,000 chips whereas the other two players have 5,000 and 1,000 chips respectively, CHIMP will tell you how much your 4,000 chips are worth in terms of real money. How to use ICM in poker. Select the number of players in (or left in) the tournament. Input the total amount of money in the prize pool. 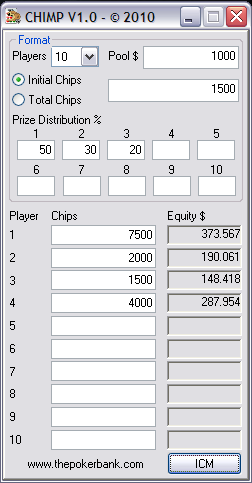 Enter the amount of chips each player started with or the total number of chips in the tournament. Input the prize pool distribution. This basically means the percentage of the total prize pool that you can get for coming 1st, 2nd, 3rd and so on. if there is no prize for coming 3rd, 4th, 5th or whatever just leave them blank. Enter each player's chip stack. It doesn't matter about the order, although it will be easier to use if you just put yours at the top. Click "ICM" and let CHIMP do its magic. the value of your chip stack will then be shown on the right. Try inputting a bunch of example situations to get to grips with it. CHIMP will tell you if the numbers don't add up. Explaining the importance of ICM for Sit and Go players is out of the scope of this little page, but you can find all the information you need in the what is ICM? article. So apart from using CHIMP to help you improve your tournament game, why else would you download this handy little program? As far as I'm aware, CHIMP is currently the only downloadable ICM calculator. So if you want to do your ICM calculations offline or just want have a handy tool next to you whilst you play without taking up the whole screen, CHIMP is perfect. It uses a lot of really unpleasant mathematics to work out the $ value of different stack sizes. You can actually work out ICM stuff by hand, but believe me when I say that it's absolutely no fun at all. For an overview of how to work out ICM in poker, check out HoldemReview's ICM calculations. I think there's just about enough maths in there for you to just go ahead and download CHIMP instead. Works out ICM values for you and other players at the table. Can work out ICM for up to 10 players at a table with varying stack sizes and tournament prize pool distributions. Why is it called "CHIMP"? Independent Chip Model Help Program = ICMHP. That's not exactly going to catch on around school playgrounds, so mix it up a little and you get "CHIMP". Perfect. Congratulations if you at least partly figured that one out already. As ever, Iain could do with a well-earned beer after sifting through and programming the mathematics behind horrific ICM calculations. If CHIMP helps you to win your next tournament, Iain would really appreciate a few dollars toward the next pint.